Bukola Saraki has revealed that he’s considering the possibility of running for the office of president against President Muhammadu Buhari in the 2019 presidential election. “I am consulting and actively considering it. I believe I can make the change,” he said. 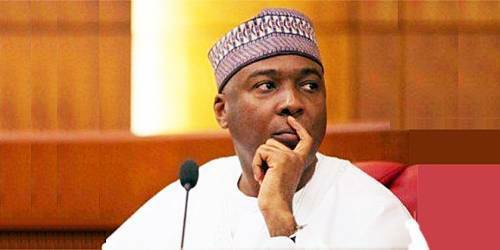 Only weeks after he dumped the ruling All Progressives’ Congress (APC) for the opposition People’s Democratic Party (PDP), Saraki said the APC has failed to learn from its victory at the polls in 2015. “The PDP has learnt its lesson from the loss in 2015, and I think unfortunately the APC did not learn from their victory,” he said. He said, “We talked about how to sustain and improve the fight against corruption; the issue of providing more powers to the states; inclusion and having a more nationalistic approach on things we do; to continue to improve the environment that will ensure investments. He said the PDP is best-positioned to give Nigerians the right kind of leadership that’ll lead the country in the right direction. “We would ensure that the party is strong on security. The APC too have not done well on the issue of security. We have the opportunity with the right kind of presidential candidate and president to provide the leadership for the party. The party has a good opportunity to lead the country in the right direction,” he said.